When she was 21, Chloe Atkins began displaying symptoms of a mysteri- ous illness. Certain treatments were tried and when none worked, she was told her illness was psychosomatic. 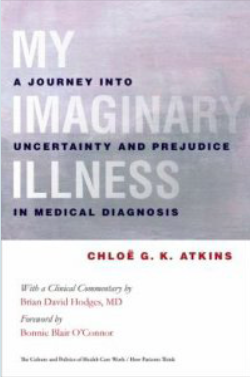 This book is about a 10 year journey of emotional and physical patient mismanagement prior to her di- agnosis of Myasthenia Gravis. Dr Atkins investigates how the medical es- tablishment applies psychological stereotypes to illnesses it is yet unable to explain. I highly recomment this book for MG patients and health pro- fessionals, especially medical students and resident doctors and nurses. It is extremely well written with many insights into Myasthenia Gravis.